Ilex aquifolium 'Handsworth New Silver' or Holly 'Handsworth New Silver' is a compact growing, evergreen tree or large shrub. It has dark green leaves which are prickly down the centre, and edged with white and small white flowers during the spring. These are followed by beautiful red berries - if planted next to or close by a male variety of Ilex. This low maintenance shrub can be grown as a stand alone specimen, within the mixed border or used for hedging. 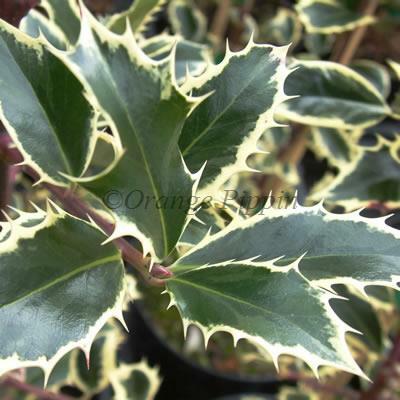 'Handsworth New Silver' is a female holly and will only produce the characteristic autumnal berries if planted near to a male variety - such as Ilex aquifolium 'Ferox Aurea' or Ilex aquifolium 'Ferox Argentea'. The hermaphrodite hollies such as Ilex aquifolium 'Pyramidalis' and Ilex aquifolium 'J.C. Van Tol', and Ilex aquifolium 'Golden Van Tol' are also compatible.